Economists, from John Locke, Adam Smith, David Ricardo, JS Mill, Tom Paine and Henry George, to Mason Gaffney, Joseph Stiglitz and Michael Hudson, were/are onto something. They thought/think, it’s crazy taxing productivity and workers, and grossly under-taxing unearned ‘ground rents’. Adam Smith said not taxing ground rent generates monopolies. He was right. So, why do we continue to carry this ridiculous burden of taxation around our necks? Were/are these famous economists wrong? No, they weren’t/aren’t. So, what the ……? It’s like this. We do it for the 0.1% and their hangers-on who work for the 0.1%, and for others who ape the 0.1% in the forlorn hope of getting wealthy in property speculation like the 0.1%. Simple. 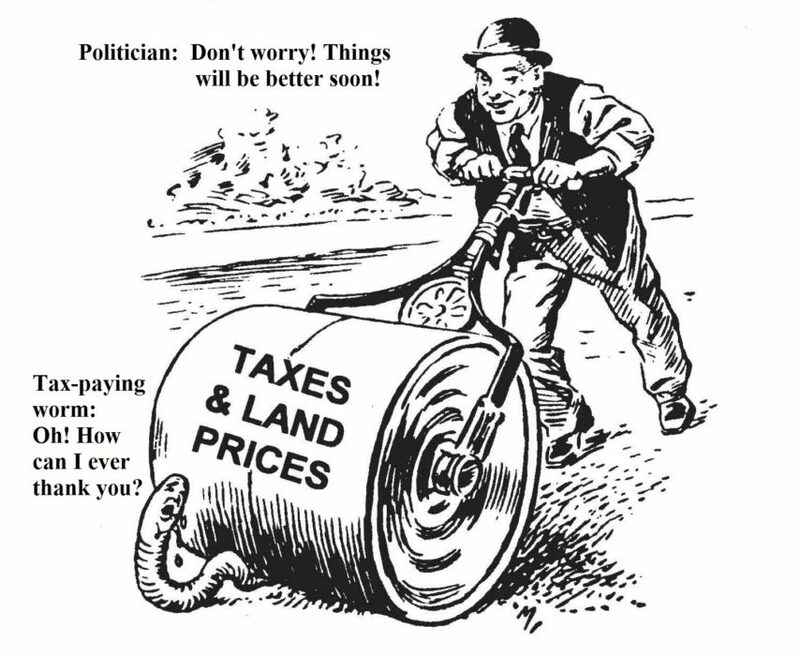 Unrealistically escalating taxes, land prices and share markets, based on rent-seeking instead of production, cause economies to founder, into repetitive recessions and eventually into economic depression. When things get bad enough for the 0.1%, reserve banks will bail them out so they may pump the share market up to unrealistic levels. It wasn’t always this bad. In fact, Australia did even better than the USA in capturing unearned incomes – at all three levels of government. There were some terrible decisions taken to reverse this situation in the last depression and following WWII. In this great confusion, it’s difficult to believe the 0.1% were not behind these swift changes ‘for the good of the people’. We was dudded! Ayn Rand and the Reagan-Thatcher era compounded these ills that have delivered us to this point in history. So why won’t economists act to fix this incredibly stupid situation? The Henry Tax Review tried to enlighten us to start making the switch back to a better tax regime (Australia’s Future Tax System), recommending we abolish more than 100 taxes and introduce a land tax. The 0.1% saw to it that it got nowhere. So, let’s capture the economy’s ‘externalities’–economic rents–folks! Despite agreeing with MichaeL Hudson that we’re being comprehensively done over by the FIRE sector–that is, finance, insurance and real estate–I certainly don’t condemn all FIRE sector practitioners. Isn’t this having the proverbial “two bob, each way”? No, it’s not. I know many in the banking industry who wouldn’t disagree with the ideas that are found on this website. It’s just that they’re not at the top of the tree. I remember a certain bank manager who was sent to the bush during the late 1980s boom because he was unable to recommend to his staff that they invest virtually everyone into a new or bigger mortgage. He was your old-style reputable banker: an avuncular Spencer Tracy type who understood the good side of banking. Fittingly, he was later called back to his major branch and his expertise acknowledged, in order to sort out the branch’s financial mess when the real estate bubble burst at the outset of the 1990s. As for the real estate industry, I’ve known many reputable real estate agents and valuers who would “buy and sell” most economists on where the economy “is at”, and why. As in banking, many are not all into skullduggery at all. Economists on the other hand …… there are none so blind ….. It is vain in a country whose great fund is land to hope to lay the publick charge on anything else; there at last it will terminate. To have made the abovementioned statement–akin to Mason Gaffney’s modern ATCOR and EBCOR (‘all taxes come out of rent’, and ‘excess burden comes out of rent’)–Locke was clearly aware that if we fail to capture ground rent directly, other sources of public revenue must introduce needless cost burdens into the community. So-called ‘tax reform’ has always managed to skirt around this basic fact. The claim has been that “there’s not enough rent”, even though it can indeed be shown that all taxes do come out of rent anyway. So, what’s the point of retaining income tax or taxes on goods, services and exchange? Well, it suits certain people, especially the politically powerful 0.1%. Landowners are then able to pass these costs on, you see? This way, they’re able to avoid paying their fair share into the public purse. And, of course, land can’t be hidden in the Caymans! 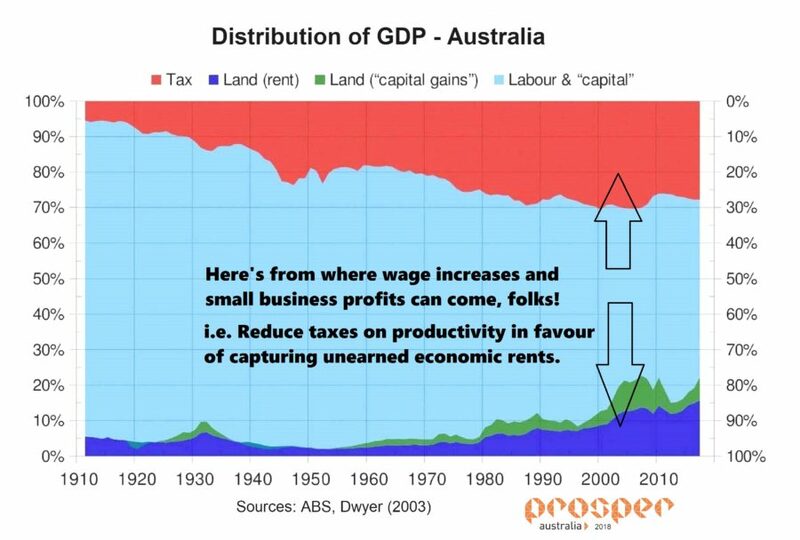 Taxation, instead of capturing ground rents, explains the inadequacy of our politicians: terribly failing economies; increasing private debt and social distress. It’s just that people don’t understand the economic underpinnings of these failures. Education is required on the point. Maybe this old cartoon bears more than a little truth? Stacey Herbert might sound like she’s laying it on thick in first half: she’s not! Michael Hudson at his insightful best in the second half. IN THIS ESSAY I describe how I – now 90 years old – have experienced the societies in which I have lived, first 67 years in Denmark where I was born, brought up and worked, and then 23 years in London, England, where I am living as a pensioner. My experiences about society began vaguely as a child in Copenhagen in the 1930s when I realised that all grown up males in the family were shop owners who made it a point of honour to be self-employed, able to pay for satisfaction of their own wants and the wants of their closest relatives, not being a burden to anybody else, definitely not burdening the society. They urged for what then was called Free Trade: trade free from governmental restrictions and customs tariffs, and they disliked taxes. The elder members of the family had all grown up in straitened circumstances and they believed that like themselves everyone in the society could make a fair living by using their natural talents. “Everyone is the smith of his own fortune” was a motto frequently heard those days. When in 1940 in the age of 11 years I asked my dad, how the public authorities should be able to pay school teachers, fire fighters, policemen, soldiers, and other civil servants if they could not collect taxes, he told me that all citizens pay rent of the land they use for housing or for business, and that the size of the rent of land they pay relates to advantages they can enjoy from the site they use and its surroundings. And my father continued that advantages of the sites are not provided by individual citizens, but by Nature or by the Society – all citizens in common – who therefore should dispose of the values of the advantages of sites. He was convinced, he said, that most problems in the society would be much easier to solve if the Government, on behalf of all citizens would collect the rent of land from all landowners and stop taxing working people’s income. That explanation was too complicated to me at that time. I found that teachers, policemen, fire fighters and presumably other public servants were needed, and I accepted that when I would earn some income I should contribute to the expenses of the society by paying taxes. However, when in the late 1950s, as a newly married husband in his late 20s, I worked long extra hours for my employer and earned extra money away from home where my wife disliked being alone in the evenings, I one day became aware that the tax authorities took 70% of my extra income. The 70% tax on extra income became clear to me when in 1959 I did my tax declaration for 1958, and became aware that in my tax-declaration for the previous year, 1957, I had made a mistake by summing up a column of figures to a sum that wrongly was Danish Crowns 1,000 higher than it should be. I told the tax authorities about my mistake and they agreed to pay me back DCr. 700. I found that 70% tax of extra income was out of proportion and complained to my father who repeated his above-quoted answer. Then I became determined to find out how it could be possible to get rid of or avoid the Income Tax System. Those days’ Danish supporters of the Income Tax system were not happy with it either; but their problem was that it could not collect enough revenue to pay for the modern society’s expenses. Every six months Danish politicians had to pass new tax laws through Parliament and so they did, until in the mid of the 1960s the Danish Government introduced a new tax called MOMS, being the same as the English VAT (value added tax). It was collected when people used the remaining part of their already taxed income. In the beginning the MOMS was collected by 5% of all purchases, but over a few years it was increased to 25% on all purchases of goods and services. 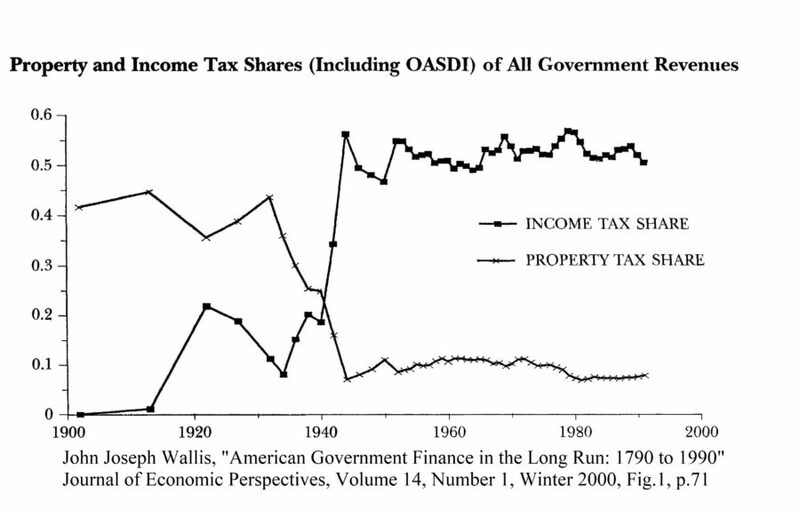 To politicians the most important advantage of the MOMS system was, that it was self-regulating: when market prices increased, also the revenue of MOMS/VAT increased; so politicians would no longer have to pass new tax laws every half year. When a Danish taxpayer earned an extra income he/she had to pay 70% tax of it PLUS when he/she used the remaining 30% of it, he/she was taxed 25% VAT of the purchases. Thus, the total tax claimed from producers’ extra income was 70% PLUS (25% of 30% =) 7½%, leaving the producer with a purchasing power of only 22½% of his/her extra income. Earlier – in the years 1942-1944 – in my age of 13-15 years I joined a scout troop that had a log cabin at a site next to a forest called Hareskoven,12 kilometres north of Copenhagen. In weekends the scouts rode their bicycles to the log cabin or they went there by an old-fashioned railway (Slangerupbanen) from the then outskirts of Copenhagen. Walking from the railway station in Hareskoven to the log cabin we went through a residential area of detached one-family houses with gardens. I liked this area and hoped one day to be the owner of a house with garden like these. In the mid-1940s (before common use of television, computers and mobile phones) I read all the books in my parents’ bookshelves and became enthusiastic about one written by the American philosopher, journalist and economist Henry George, translated into Danish. I do not remember the book’s title, but it threw bright light over several problems I had been pondering over for a long time, such as unemployment, taxation, free trade, sharing the results of cooperation, etc. It made me start studying these themes thoroughly. I read writings and listened to lecturers of Danish philosophers, social critics, political innovators, and other idealists such as Jakob E. Lange, Sophus Berthelsen, Kr. Kolding, C. N. Starcke, J. L. Bjørner, C. Lambek, Viggo Starcke, Knud Tholstrup and many others, and I joined the youth group of the Danish Justice Party that urged for public collection of the Rent of Land instead of taxes on production, producers and products, and for Free Trade. In the beginning of 1958 I became aware that an empty building site was for sale in the area I liked, and soon thereafter my wife and I had bought the empty plot on conditions of mortgages we could afford. We expected that after 10 years’ time we would have paid up the mortgages and then we hoped to be able to pay a builder for building a house on it; and after the ten years we reckoned that the old-fashioned railway line might have been replaced by an extension of the Copenhagen metro. However, less than two years later I was called by phone by the owner of the one-family house next to our building site. He wanted to buy our site and offered a good price that we accepted. The amount that remained in our hands when we had repaid the mortgages and paid estate agent and lawyer and taxes, had the size of the salary I could earn (before tax) for one years’ work. That was the outcome of a less than two years’ investment in a down payment and a few instalments + interests. Then – late in 1959 – we found a house for sale (10 km west of Copenhagen) that was near to the house of my parents-in-law, which suited my wife’s and my demands. My wife was pregnant, and her mother would look after our soon new born child when my wife and I went to our respective working places on weekdays. So we used the profit from selling the empty building site as down payment for the house near my wife’s parents, and took mortgages for the rest. It was a detached single-storeyed one-family house, but small (104 m²), with a comparatively big garden. We lived there for 10 years. Then our daughter needed a bigger room, and my wife and I would prefer to live nearer to the centre of Copenhagen where we both went daily to our working places, and our daughter went to school. So, in 1968 we found a building site for sale in the outskirt of the Borough of Copenhagen and bought it and asked a building company to build a big standard house (160m² + 90m² basement) that had all the qualities we had dreamt of plus a very big garden. We paid the down payment with the profit from sale of the smaller house 10 km west of Copenhagen and took mortgages for the rest. We lived there for 15 years. Then our daughter in her age of 24 years had moved from home, and we in our late fifties felt that the big garden was now more a burden than the pleasure it used to be. We then bought a big flat – without a garden – in a block of flats near the row of lakes round the inner Copenhagen, but in a short distance to public parks including Copenhagen’s Tivoli. When our ‘dream house’ was sold we had more money at our disposal than we had ever dreamed of. In 1995 we moved to a four-bedroom house in the northern part of London that our daughter who had settled down there with her husband had bought for us for £72,000. The market price of that house was in 2015 assessed by Estate Agents to £630,000. “There is not such a thing as a Free Lunch”. I experienced that people got work-free income when they owned things whose values increased because of increased demand, or because of decreased supply. It happened to services, to stocks of goods, bonds, shares, livestock, real estate or other monopolies, or whatever. The reason for increased demand or decreased supply could differ from case to case, such as failing harvest, blockade, war, new technology, successful sales promotion, lower taxes, increased population, withdrawn restriction on trade, progress in the society’s economy, etc. However, sometimes values decreased because the demand slowed down, or because the supply increased. Values of Real Estate (landed properties) were most of the time increasing because the development of society escalated; but sometimes set in an economic crisis that decreased values of Real Estate. Experiences have proved that that has happened through centuries approximately every 18th year (so the next crisis may be around 2026). The events that triggered these backlashes differed from crisis to crisis, but they have happened anyway approximately every 18 years. It is bad luck if you have to sell your property when its market-value is low. If you don’t have to sell, you may expect that the value will regain later. If you are well off you might take advantage of the depression and buy a cheap property. The seriousness of the crises seems to escalate from one 18 years’ period to the next (so the 2026-one will probably be really bad), and always the people who don’t own things of value – comprising most young people – and only live of what they earn by their work, or of a pension that have been reduced by taxes and by other unavoidable expenses claimed by powerful claimants, are among those who suffer most, unless they are gifted with or have developed strongly sought-after abilities. I find it excellent when talented and skilled and hardworking people earn great money by their productive exertions (physical or intellectual) that make the community a better and a more enjoyable place to live. But I – urging for equal possibilities to all human beings – don’t like and am very much annoyed with and against that the Government allows and protects some people to absorb for their private satisfaction gifts of nature and society that could have been natural free gifts to all mankind. I agree that landowners must have exclusive right to use their land, but they don’t need and should not be allowed to keep the Rent of Land created by Nature and by the Society, and other monopolists should not be allowed to keep the Extra monopoly-profits they charge on top of the prices they would have been satisfied with had they not had the monopolies. Monopolies are approved and protected by the Government and the extra Monopoly-Profits should go to the public and be used to the benefit of people in general. Then dead-weight taxes on productive people could be reduced, maybe abolished. Landless people and people without any monopoly, who are unable to absorb anything of the free gifts of nature and society, are cheated every day, month after month, year by year, by the system that lead the values of nature and society to a few holders of monopolies and economic privileges. As long as a Government maintains such a system, I accept that individual citizens seek to get a share of the free gifts of nature one way or another in order to reduce the cheating they would else suffer every day. I sympathise with those who – in order to diminish the cheating they were else exposed to – urge for getting a house and its today privatised rent of land; but I become sad when such people care for themselves only, and ignore that their fellow citizens – working but landless – are cheated daily for advantages they could have of public collection of publicly created values and public use of it to the benefit of people in general. As long as the technological development of societies are progressing, the market will provide producers with reasonable market wages – even when the gap between landowners and landless people expands. However, if we keep the system as it is to-day, when the technological progress has to stop (because of climate change, pollution, or whatever) the market wages will sink towards minimum existence. 1. A mythical scenario in real estate, where no one loses money. 2. A lie you tell real estate buyers as you unload into a declining market. I was honoured to know Phil Day (1924 – 17 March 2011). He was a colleague on the Land Values Research Group. 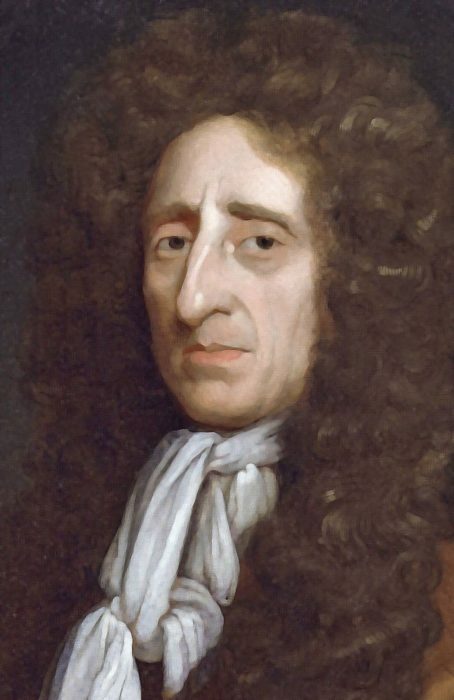 Phil was a town planner who, having “seen the cat”, worked unassumingly but tenaciously for the principle of drawing revenue from the use of land instead of taxing labour and capital. Phil committed his thoughts to two books, “LAND: The elusive quest for social justice, taxation reform and a sustainable planetary environment” (Australian Academic Press, Brisbane, 1995) and “Hijacked Inheritance: the Triumph of Dollar Darwinism” (CopyRight Publishing, Brisbane, 2005). Phil was a great administrator and town planner. 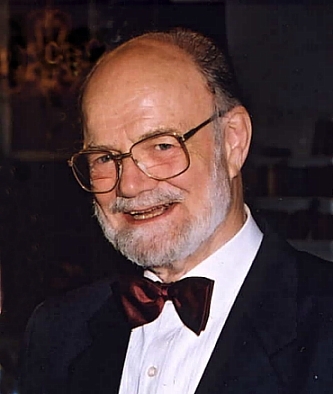 Dr Phil Day was a progressive advocate for reforms in planning, development control and taxation. He was born in Brisbane in 1924 and died in Brisbane in 2011. Dr Phil Day’s achievements in town and country planning during any one of his senior official appointments would have been worth commemorating. Summed up, they represent an outstanding record of public service and an enduring contribution to public policy. Then, for more than 20 years after official retirement, until his death on March 17, he continued advocating progressive reforms in planning, development control and taxation. Born in 1924 and raised in Yeronga, Philip Denny Day completed primary school in 1937 by winning the coveted Lilley Medal in the state scholarship examination. After finishing school at Anglican Church Grammar School, he began a law degree but enlisted in World War II as soon as permitted. During his seven years in the Army he learned Japanese and served for three years in the occupation forces in Japan as a commissioned intelligence officer. Following repatriation, he graduated in 1953. He joined the Commonwealth Public Service in Canberra and from 1955-59 also held part-time elected office on the ACT Advisory Council. He moved to Sydney where he qualified in town and country planning and joined the Department of Local Government. Dr Day transferred to the Department of Decentralisation and Development in 1968 and rose to director. There, he promoted growth centres as the best vehicle for stimulating population growth in regional towns and significantly influenced the Commonwealth’s growth centres policy of the 1970s. Dissatisfied with ineffective implementation of regional policy in NSW, Dr Day returned to Queensland as Brisbane City Council’s director of town planning. His commitment to the public interest resulted in clashes with the strong-minded but development-orientated lord mayor, Clem Jones. 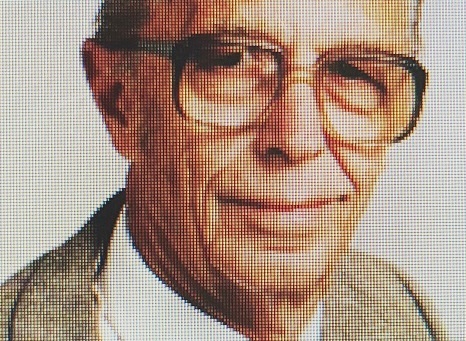 He left to join the redoubtable Professor Lewis Keeble in the Department of Regional and Town Planning in the University of Queensland and was head of school from 1977-80. From 1980-82 he was seconded as director of the Australian Institute of Urban Studies before returning to his teaching role, from which he retired in 1988. In 1989, as a member of the Chalk Committee of Inquiry into Valuation and Rating, Dr Day wrote its final report. To this day it stands as a landmark exposition of city financing. As editor of Queensland Planner for 16 years from 1987, he influenced professional opinion through plain-spoken editorials and attacks on transgressions of good planning policy. He is remembered with respect by a generation of planners he educated. Queensland planners treasured Dr Day as one of the consciences of the profession, an intellectual giant yet unaffectedly modest, and honoured him with Life Fellowship of the Planning Institute. In retirement he authored a flow of forthright articles for, among others, The Courier-Mail and property consultants King & Co’s magazine King’s Counsel. Other abiding interests included the “lawyerisation” of planning, the process-heavy planning legislation in Queensland and decentralisation. Dr Day was a visionary who argued that concentration of population in the southeast would entail construction of inevitably unaffordable infrastructure, as Brisbane’s tunnels are turning out to be. In his latter years he was upset at the creeping dominance of economic rationalism that starved departmental budgets, corroding the foundations of the tenured professional public service crucial to giving governments advice. Friends, colleagues and students mentored by him can best honour his memory by continuing to uphold public interest planning and progressing the causes he held dear. Dr Day is survived by children Diana, Michael, Richard, wife Jinn, grandchildren and former wife Nancy.